Does anybody use Masterslider query plugins? If you do, are they easy to add? There seems to be some slick image and text sliders for 23 usd (£17). You do - for your image “hotspots” + tooltips. So it should not really be any harder to add other features that are available, that you are wanting to try. are they easy to add? Ye, I know I do, you gave me loads of help setting it up. I want to try sliders but the hotspots took ages to set up and I still get error when I add code to head. 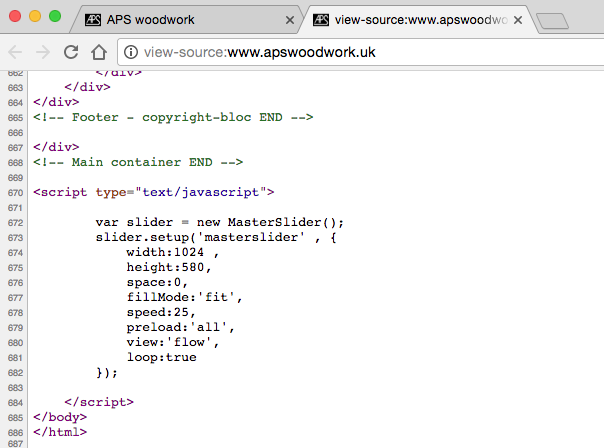 I think Masterslider uses an older version of jquery! Not sure really. I’ll read the link you posted about adding the plugins. Purchasing a new version of MS may give me up to date files to use. It might, not sure it requires it however. Blocs looks like it currently uses 2.1.0 version of JQuery (but 2.2.4 is the latest of the 2.x.x version). The latest actual version is 3.2.1. I can’t imagine MasterSlider not working with either of those versions, especially 2.1.0 that Blocs uses. The MasterSlider Quick Start, should show you the general basic setup. As associated to Blocs, via Page Settings, and the HTML Bric for setting it up. From there its just a matter of adapting it to your requirements. The documentation link from above, should help with that and all the available options and features. Should I pay for Master Slider updates? No, the updates are free forever. That’s a close match I forum names! The version I have applies jQuery v1.10. Do you or have you used MS? I think I’ll try an up to date version and I guess I’ll have to add code, etc after export. Since you get free updates, I would download the latest and work with it. There should not be an issue with JQuery, as the hotspots worked previously for you with the Blocs JQuery 2.1.0 version, so its a non-issue since the user includes JQuery during setup when using. I have not used it, but it looks like its usage and setup are pretty standard though. Curious, so it does not work well via Blocs Page Settings, and the HTML Bric for setting it up ? I have a new copy now. Great to use.